Feather light yellow cake is a cake that is dense, but nice and light at the same time. Who knew that there could be such a cake? We celebrated our family monthly birthdays with this feather light yellow cake and it was so amazing! We Truly enjoyed every bite. Feather light yellow cake is a cake made from scratch that we use to make years ago. It has been around for a long time, and every time I make it, I am always well pleased. I love to make it ahead of time and then freeze it, because it makes it a lot easier to frost. I put raspberry filling in the middle of the feather light yellow cake, and then frosted it with a delicious chocolate frosting. However, you could put any kind of filling in it that you want. I wanted raspberry because the raspberries are so beautiful. I know that everyone else loved it too because it was almost gone after our singing Happy Birthday. We enjoyed some vanilla ice cream on the side. Let me tell you a crazy story. So last week all of a sudden my back started hurting. There was a couple of days, that I couldn’t stand or walk. So, I decided that I would go to one of these walk in chiropractors. (Not recommend). When I came walking out of there, I felt like I had joined the WWE Wrestling team. And I wasn’t walking any better. So the next day, I worked and by that night I couldn’t stand it. So after I was done working the next day, one of my clients told me to go to a different walk in place and when I got there, there was a big blue sign on the door and it said, “We are sorry for any inconvenience, we had a family issue and we will be back next Monday”. So I went to the next place and they close at 12:00 PM on Fridays. I went home. The next day we went to Idaho to spend the day celebrating my grandson’s birthday. I did not ride the inner tube on the water slide. Then the next day I went to church and I think that I did too much sitting, by the time I got home, my husband told me to walk it off. I went a half of block and had to come back home. Monday the chiropractor that I like to go to was closed because the kids were out of school. So I went to a different guy. He popped it in and I came home only to have more pain in the next two hours. So the next day I decided to try a massage. I called the chiropractor that I like the best and they said that they could get me in the next day. I told my husband if he couldn’t help me I was going to get x-ray to see if my back was broken. After the massage it felt a little better the next day, but it was still catching! I went to the chiropractor and I guess that I was so anxious, I was an hour early. I left and came back. Well, every time he would put my back in. when I went to get up, it would go out again. So they put me on the water table. Then he adjusted it again. Same thing. He asked did you fall? “No”, I answered, “but it must have gone out when I went to the dentist last week and sat in the chair so long”. So then he asked me what tooth I had worked on and when I told him he said, “looking at this chart on the wall it says that if you have that tooth worked on it would affect your knee”. Oh, my word, last week when I was at Disney World, my knee hurt so bad that I went to the store and bought some Icy Hot and put on my knee. Then all that walking around messed up my leg and then my back. Is that crazy. So he adjusted my knee and then my hip and them my back. I can even walk now. Yes, I am stiff, but I can walk. But after being gone for a week and then taking a week off, my house needs a cleaning lady that can bend, lift, and move fast. I would even make her a feather light yellow cake, and I know that she would be back the next week just so that she could have more cake. I hope that you get a chance to try feather light yellow cake. I am sure it is so light that it can’t have that many calories. Sift all the dry ingredients together. It will make the cake more light and fluffy. Use any filling that you choose. Whatever your family or friends prefer. You could even add some chocolate shavings for an extra fancy look. 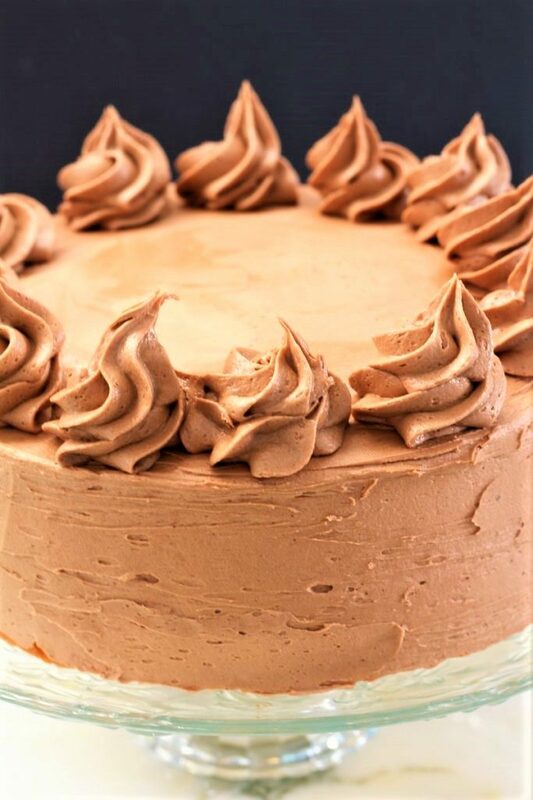 Freeze the cake for at least two hours and then the frosting will stick better when you go to frost it. Make sure to dry the berries after washing them before placing them on the cake. Chocolate frosting is great in the middle too. Decorate with chocolate candies of your choosing. If you do not have cake flour, make your own by measuring the right amount of flour, then for every one cup take out 2 Tablespoons of flour and add 2 Tablespoons of cornstarch, sift the flour 4 – 5 times and then you are good to go. Mix the frosting for at least 4 – 5 minutes. Sift together cake flour, sugar and baking powder into a medium mixing bowl. Add the milk, melted butter that is slightly cooled, egg, and vanilla. Mix for about 1 minute. Then beat for an additional 2 minutes on high speed. Pour the batter into two greased 9" round baking pans. Bake @ 350 degrees for 40 minutes, or until the center comes out clean when tested with a wooden pick or cake tester. Cool in the pans on a wire rack for 7 - 10 minutes. If you are going to decorate it, wrap in plastic wrap and place in the freezer for 1 - 2 hours. Remove from the freezer and remove the plastic wrap. 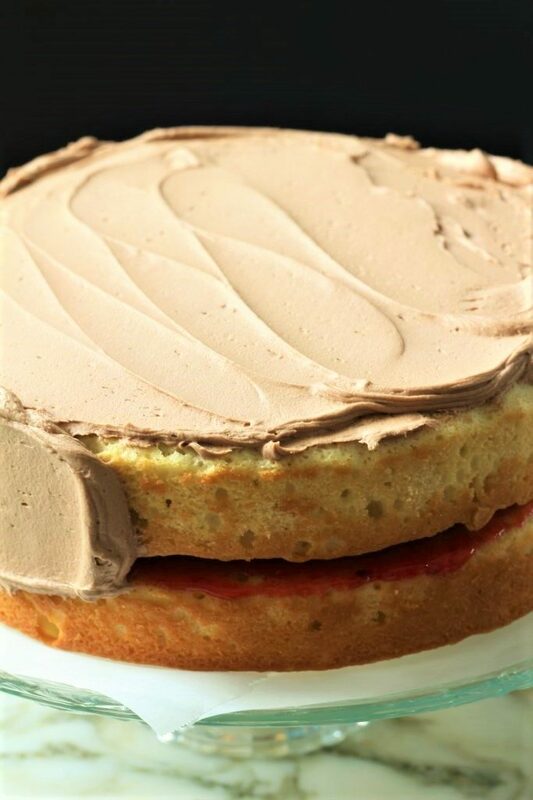 Place one of the cakes onto a plate or flat surface so that you can frost it. Put 1 cup of filling on top of the first cake. Place the second cake on top of the first cake (and pie filling) and then frost the cake. Place the butter into a medium bowl. Add the butter, chocolate, powdered sugar, vanilla and milk. Mix on a high speed for 4 - 6 minutes. You cannot over mix it. Thank you. My back is doing a little better, but it sure has not been fun. I do like my chiropractor. And you are right – let’s eat cake! Thank you so much for your continued support. Absolutely beautiful. I’m not much of a baker but you’ve made it sound pretty easy! Thanks for sharing at the What’s for Dinner party! Hope to see you next Sunday too. Have a wonderful week. This cake took a little while to make, but anything for special people in our lives makes it worth the work. Have a wonderful week. And thank you! 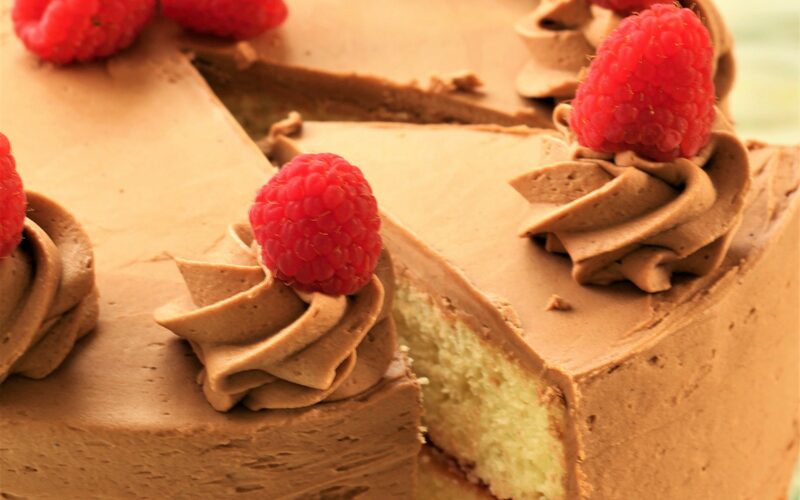 Wouldn’t that be nice if we could just reach into a picture and pull out a slice of cake!?! I would definitely go for that! Thank you for coming by and leaving a comment. I am drooling over this cake. Love your recipes. Thank you. I’ll be there. Looks divine! Thanks for sharing with us at the To Grandma’s House we go link party! Thank you! And thank you for having a link party, I sure appreciate all of your hard work! I had to come check out this cake because I’ve been seeing it everywhere this morning and it looks so good. I hope you saved a slice for me! You are the best!! I wish I had saved you a slice, or even two just because you are the sweetest! Have a wonderful week end! Your cake looks amazing, I have not made a yellow cake from scratch in so long. thank you for sharing on Friday Features last week, this week your post is being featured on Friday Features, I have Tweeted and Pinned on Pinterest and on Instagram!. Be sure to stop by and share again with us! Thank you so much for featuring our Feather Light Yellow Cake. It is kind of fun to make a cake from scratch every now and then. We appreciate your hosting the party. We will be back. Oh,Happy Birthday!!! I wish I was closer so that I could bring you the entire cake. 😉 Enjoy your birthday!